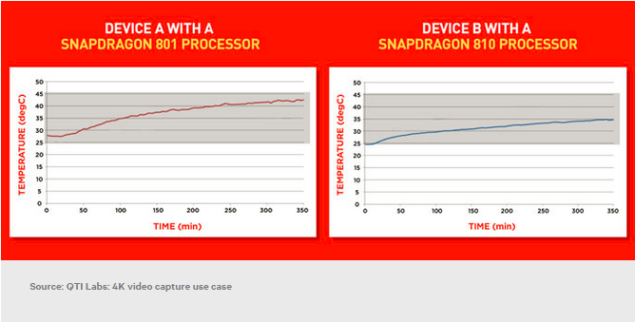 The Snapdragon 810 Appears To Be Cooler Than The 801 - But Will It Compare Better Against Others? The Snapdragon 810 Appears To Be Cooler Than The 801 – But Will It Compare Better Against Others? We’ve already told you about how the Snapdragon 810 is one of chip maker Qualcomm’s most diverse offering yet. Being one of the first in Qualcomm’s portfolio of octa-core 64 bit offerings, the Snapdragon 810 uses four Cortex A53 and four Cortex A57 cores. In addition to this, the chip features special support for 4K devices, as with the Snapdragon 810 not only will you be able to record 4K videos, but play them on supporting screens as well. 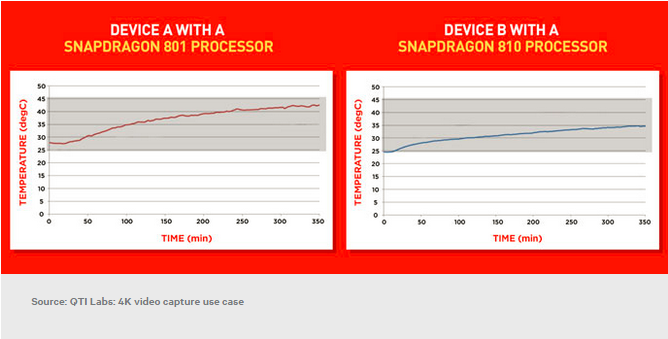 Some new stats have become available for the Snapdragon 810 today, and as expected they beat the Snapdragon 801. The image above shows the skin temperature for a commercial 801 device and a non-commercial 810 device when both were playing Asphalt 8 at 30 fps. When performing at equal levels, as can be seen from the images above, the Snapdragon 810 does heat up less than the 801. Similar performance stats for 4K recording on both the 801 and the 810 can be seen below. However, neither the source nor these images end up describing more on how the Snapdragon 810 will end up faring when it’s complete capabilities have been tested. A much better comparison would be the 810 operating at peak loads and the results then subsequently compared with a processor in the same category. Qualcomm’s due to face some heavy competition next month, when Samsung launches its Galaxy S6 smartphones. The Korean manufacturer is launching the Galaxy S6 and the Galaxy S6 Edge with its own Exynos 7420, which succeeds the Exynos 7410, a performance beast in its own regard. So while today’s stats do provide a helpful insight into the Snapdragon 810, whether Qualcomm’s silicon actually stands its ground can only be known once more devices running the chip and detailed benchmarks appear. Some waiting is in line as several devices are expected to come with the Snapdragon 810 this year, including the likes of the HTC One M9 coming next month, Sony’s potential Xperia Z4 and LG’s upgrade to the G3, the LG G4. We’ll know more then once these devices become available. Till then, stay tuned. We’ll keep you updated.